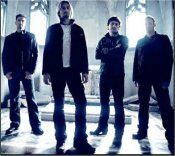 All of the following Nickelback Images I have collected from different web pages around the internet. I do not take any credit for owning any of the following Nickelback Images. To my knowledge they are all Nickelback Press Photos free to be distributed. If you click on any of the following thumbnails, they will enlarge.